It was my plan to attend mass this afternoon. I thought it to be an ordinary mass since it’s a Tuesday and nothing’s so special about this day. I was wrong, I forgot..today is May 31- the last day of the flores de mayo (Flowers of May)- a month long church festival every May in veneration to Mama Mary. So when I came, a bishop was presiding the mass ( I was late! I came in during the gospel reading :)) my first question was “Why a Bishop?’ As I listened to my his sermon, I came to know that it was supposedly the Culminating Activity for the flores de mayo hence the celebration was kinda grand. 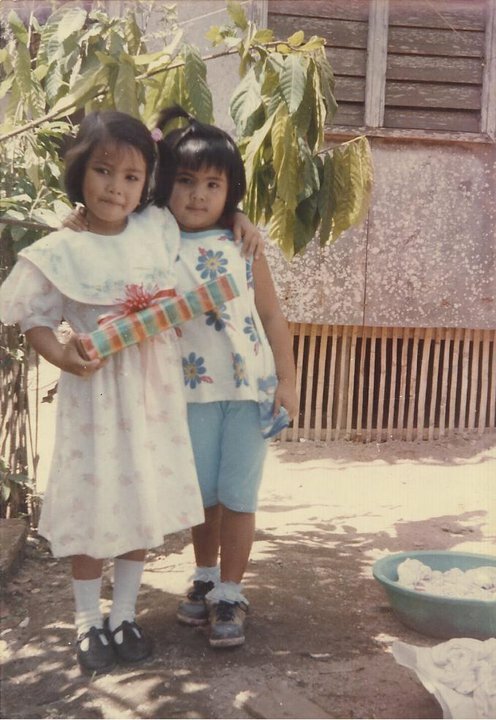 We were little girls then, my friend’s names were An-an, Atoy, Cristina and Precious. 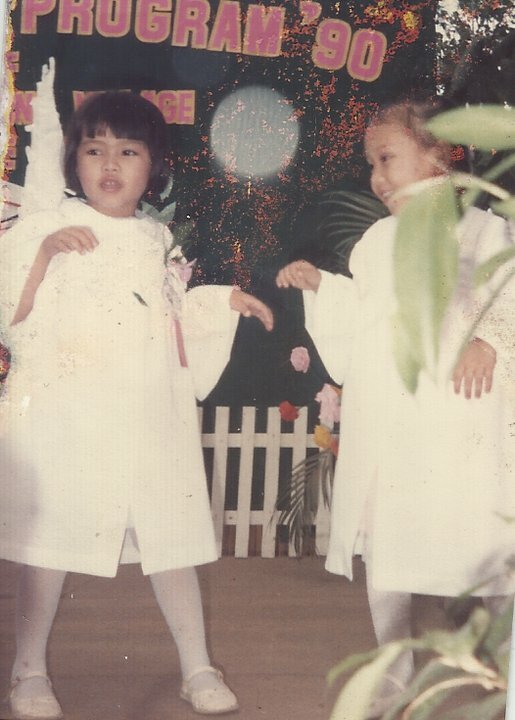 It was summer so we always had the chance to attend the Flores de Mayo. After hours of playing around the neighborhood, we would eventually have the consensus to dress up for the flores. After dressing up, we’d get three to four stems of bougainvilleas from our backyard then were off, taking the shortcut route to the church ( we always walked from our houses to the church). On our way there, if we see flowers without owners, we sometimes pick them and add them to our bougainvilleas. Since the offering of the flowers would not take place until the end of the mass, we just stayed outside the church during the mass. While waiting, we’ll try to search for flowers to add up to our collection and since we were children, there would always be that competition on who gets the most number of flowers or who brings the most beautiful flower. In my case, I seldom win since our backyard has only one kind of flower planted- those bougainvilleas! We’d drool with envy if we see a group of children bringing a bunch of roses or daisies.We’d then make a fuss about how rich those children could be since they have those flowers on their backyard! (i’m laughing at the memory of it!). Then if a child would be bringing some orchids, we’d just stare at her and envy everything about her (oh children!). When its almost the end of the mass, we would then line up ourselves at the entrance of the church. The front liners would be the angels- they are kids dressed like angels- their dress must be white and they must have a pair of wings(either made with real feathers or japanese paper). I’ve always wanted to be an one yet I was never recruited to be an angel during the flores. Up until now I would ask my lola why she did not volunteer me to become one and she would just answer me with a shrug. Adults were assigned to carry the letters AVE MARIA, one letter for each, and guided by two angels on each side. They would then traverse the entire pathway towards the altar. Of course there is singing and prayers are said throughout the entire veneration. The last would be the offerers and that would be us. The children would come first singing the ave maria then the adults would follow with their flowers. ”Please stand“… and I was backto the bishop’s sermon. Thing is, flores de mayo was one of my most looked after activity for summer when I was a child, and I bet most of you agree to this. Yet as I observe during the mass a while ago, there were more adult offerers than children. In my time, children rule the flores de mayo– there was the angst and the eagerness of the children as they push their way up to the altar. I picture it out as a convention of children everyday for the whole month of May. It was a blast! So where are the children now? Should we blame the parents for not encouraging their children to attend the flores or the church for not actively campaigning?